Bead rollers can be used to form channels in otherwise flat pieces of sheet metal to give the panel rigidity. This is commonly used to form floors, joggle panels, or make decorative patterns. Generally I approach Harbor Freight tools as I would approach a strange dog - with a large degree of caution and with a small degree of blind optimism. If you buy something that you've never tried using - like said bead roller - and your work turns out awful, you never know what percentage of man vs. machine produced the failure. Am I a natural born bead roller with terrible tools? I may never know. 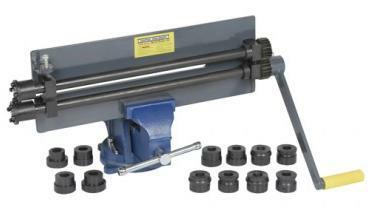 Anyways, I picked up this entry level bead roller on craigslist for about $70 bucks, or roughly one third of retail. The guy used it once to make floors for a Camaro and then just never used it again. Was the experience that bad that he wanted to rid himself of any reminder? I figured I'd try it out. The roller is rated for up to 14ga. steel but that seems to be wildly optimistic. I was rolling some 20ga. and the mounting plate for the rollers flexed, causing the rollers to start orbiting each other. If you are trying to roll metal thicker than 22ga., it would be wise to tension the rollers slowly and make several passes. I did find that this behavior can be improved/eliminated if you only mount the roller as far off of the table as needed to roller your work. For example, if you are rolling a bead 3 inches from the edge of the sheet, mount the plate 4 inches from the table. Speaking of mounting, you need to get a little creative when affixing the roller. The vice shown in the ad is nowhere near big enough. I ended up clamping the assembly to a metal grinding stand which keeps it adjustable and at the right height. This is a great tool to have around and I'm not missing my $70, however, if I had paid the suggested $199, I think I would need a bit more time to make a decision. It may be worth it but I haven't had enough time to assess the durability or lack thereof. All in all, I'm happy with it so far. As long as the base is properly braced and you take your time, you can get decent results.